Access to state-of-the art equipment and rapid, accurate communication are the most critical concerns of an emergency medical transportation provider. At Trinity, we believe in the power of technology and are heavily invested in the most advanced equipment and systems enabling us to provide the highest quality care for our patients. Our Communications Center has become the 231st Accredited Center of Excellence (ACE) in the world through The International Academies of Emergency Dispatch (IAED). Currently Trinity is 1 of only 2 accredited “Centers of Excellence” in the state of Massachusetts. The professionals who staff our Communications Center are all certified as Advanced Emergency Medical Dispatchers through the IAED. Our Center utilizes advanced technology for live vehicle tracking and call prediction software. Trinity utilize Zoll RescueNet and Genesis Pulse which provide candidate rankings for dispatch to send the closest ambulance. Automatic Vehicle Locator (AVL) GPS feeds directly into the RightCAD so our Emergency Medical Dispatchers can monitor every vehicle in our fleet 24 hours a day and ensure that the most appropriate resources are sent to every call. Trinity also uses RescueNet Deployment Monitor from Zoll which utilizes historical data for call prediction, allowing our dispatch center to deploy our fleet in high volume areas ahead of time to reduce response times. Trinity GIS Department can edit the RightCAD mapping software to add new streets and pictures to ensure our maps are up to date for accurate response. ProQA Software is Trinity’s Medical Priorty Dispatch system which is relied on by over 2,000 call centers worldwide. The MPDS protocols developed by IAED allow us to rapidy triage emergency calls and dispatch appropriate resources. The system also allows our dispatchers to assist callers with CPR, Childbirth, bleeding control as well as assist callers with medication such as Aspirin for cardiac emergencies or Narcan for overdoses and much more. Are you a current Trinity municipal 911 client and need help logging into FirstWatch? Please contact Jon Kelley at jkelley@trinityems.com. At Trinity, experience and dedication are only half the equation. The hub of our operation is our digital state-of-the-art communications center complete with GPS. This sophisticated high-tech center utilizes a dispatch tracking system that allows us to monitor the activities of every vehicle in our fleet and insure that the most appropriate resources are dispatched to every call. It also allows us to monitor our on-time performance as a regular part of our daily quality assessment review. The professionals who staff our 24 hour-a-day operation are all certified as Emergency Medical Dispatchers. Our communications center is supported by an emergency generator system that ensures our ability to receive calls as well as dispatch vehicles even during electrical power outages. 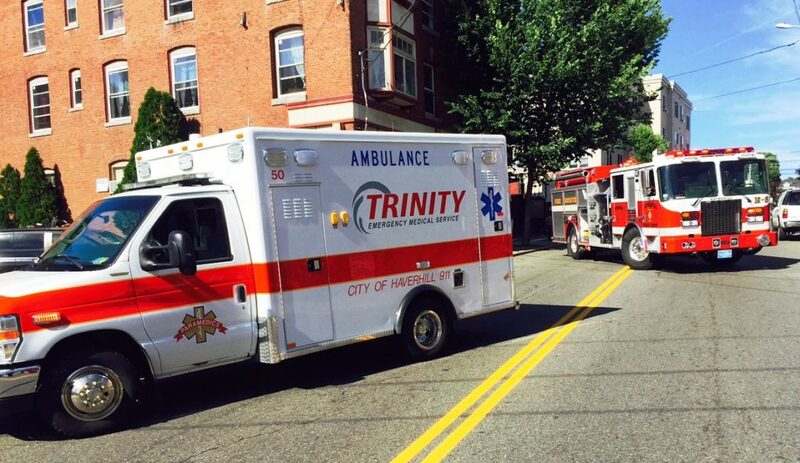 Trinity is one of the only ambulance providers in Massachusetts to also offer a secondary PSAP (Public Safety Access Point) for municipalities. The secondary PSAP allows for a 911 operator to transfer a medical call directly to Trinity’s dispatch, which can save a town or city valuable time and money. Trinity was one of the first to adapt the RightCad-Sanitas technology which integrates our dispatching and billing systems. Trinity ambulances are also equipped with Getac V110 rugged laptop computers which instantly link our vehicles to everything from directions to vital patient information. This provides a real-time, wireless link between each vehicle and our Command Center. Learn more about our other life-saving Technology.